Posted on Wed, Jan 11, 2012 : 6:20 p.m.
Michigan coach Brady Hoke, shown on the sidelines at the Sugar Bowl, has verbal commitments from 14 of Scout's top 300 players. Brady Hoke's first complete recruiting class as the Michigan football team's head coach continues to draw acclaim for its depth. Scout released its final top 300 player rankings on Wednesday, and 14 verbal commitments to Michigan made the cut, including six among the top 100. That helps to illuminate just how prolific Hoke and his staff have been, especially when compared to their primary competitors on the recruiting trail. The Wolverines' 14 players in the top 300 easily beats Midwest recruiting leviathans Notre Dame and Ohio State, who fielded nine apiece, and dwarfs in-state rival Michigan State, which had just two. Michigan also is leading in the Big Ten. Trailing its 14 in the top 300 are Ohio State (nine), Wisconsin (five), Iowa (three), Nebraska (three), Michigan State (two), Northwestern (two), Penn State (two) and Purdue (one). That gap could close, as the Wolverines have only about four spots left for their 2012 class. But their work so far has been impressive not only for its quantity, but also its quality. Thirteen of the Wolverines' recruits were given four stars, and offensive lineman Kyle Kalis received five stars. He held steady as the country's No. 6 guard, although his overall rank has slid from 22nd in April to 35th. Defensive tackle Ondre Pipkins, meantime, has made a huge leap, rising from 188th last year to finish as Michigan's second-best recruit at No. 65. He is a 6-foot-3, 320-pound prospect from Kansas City and is expected to be a serious player for snaps next year. Another big gainer is linebacker Joe Bolden, who already is enrolled at Michigan. He is perched at 69th after being ranked 238th in April and, like Pipkins, could be a contender for playing time as a freshman. Some Michigan recruits whose stock has dropped since April: Linebacker James Ross, 72nd to 83rd; defensive lineman Chris Wormley, 112nd to 164th; cornerback Terry Richardson, 139th to 183rd; receiver Amara Darboh, 164th to 205th; tight end Devin Funchess, 146th to 221st; and safety Jarrod Wilson, 151st to 245th. View Scout's complete player rankings here. Mon, Jan 16, 2012 : 12:13 a.m. I see THE Ohio State university landed two 4 star prospects over the last two days. After they land the offensive lineman from Illinois that should put them ahead of Michigan in recruiting. They actually mat be rated above them after getting these to smart young men. When was the last time Michigan had a commitment? November? Urban is working his magic at the expense of Michigan and the Big 10. I understand your humiliation after the vest beats you like a red headed step child for 9 years. Urban is going to make the vest era look like the RR era at Michigan. It will not be pretty if you are a Michigan fan. GO BUCKS. While this is all fun to see the rankings, and it is impressive that Michigan and Hoke are getting (on paper) highly rated athletes, we all should remember that it is up to the coaching and motivation of these players to see where they end up. Often, coaching will be much more important than these star ratings, and that is where I feel Michigan has the biggest advantage. But these guys are all high schoolers now and a lot can happen. Go blue. Mon, Jan 16, 2012 : 12:09 a.m. Sat, Jan 14, 2012 : 4:37 p.m. Sat, Jan 14, 2012 : 1:53 p.m.
Albee Macaw I will bite on your bait as well. What recruits and in general any 18 year old can see immediately is someone who is a real. 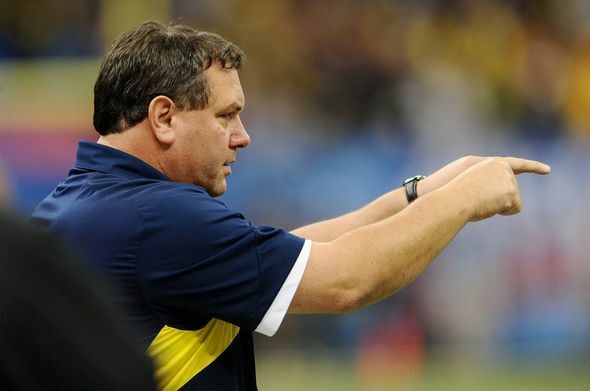 Brady Hoke is real. Doesn't try to be what he is not and tells it like it is. Speaks plainly and is absolutely straight up with kids. Urban Meyer on the other hand is as fake as they come and you can spot it a mile away. Just ask the Florida fans who were duped by his supposed retirement. Mon, Jan 16, 2012 : 12:12 a.m. I see THE Ohio State university landed two 4 star prospects over the last two days. After they land the offensive lineman from Illinois that should put them ahead of Michigan in recruiting. They actually mat be rated above them after getting these to smart young men. When was the last time Michigan had a commitment? November? Urban is working his magic at the expense of Michigan and the Big 10. GO BUCKS. Albee Macaw, I'll bite on that bait. Urban Meyer's career took a nosedive when Tim Tebow left Florida, and soon Urban was sick/retired. If he doesn't find Tebow-caliber players at Ohio, he might just be sick/retired again soon. Hoke on the other hand, took over a team in disarray and in one year built it into a powerhouse -- using primarily the same players. The difference in the two coaches' trajectories is huge. Meyer gets credit for past achievements while his more current failures are ignored. Hoke has current achievement after current achievement (Ball State, UCSD, Wolverines). Maybe Meyer needs to eat more and jog less. Fri, Jan 13, 2012 : 2:12 a.m. Incredible recruiting by Hoke and staff. Great job! We will be well positioned for years to come. Very difficult to determine who gained and hwo lost ground because of some of the recent combines and All Star games. The aformentioned young men who slipped in the rankings will do very well playing for the Maize and Blue and I wish all them the best while at U-M.
We are quickly approaching a time when true Freshman will not be able to crack the two deep at Michigan. Have not seen that in a while. Fri, Jan 13, 2012 : 12:19 a.m.
sandy, Not even Nick Saban could win at MSU when Michigan had proper coaching and recruiting. Mark D's days of winning in this state are over. Thu, Jan 12, 2012 : 5:12 p.m.
your correct there is no trophy for recruiting. But its part of a process. I would like to congratulate MSU for 2 winning seasons in a row. I realize such rarefied lofty territory can give a Sparty fan a case of the vapours. Thu, Jan 12, 2012 : 8:59 a.m.
&quot;Ohio: will always have as 'roughly&quot; much talent as Michigan because they sit on an ocean of in state talent and are the only top football program in that State. With the great recruiting of Hoke and company, it will all come down to coaching. If Michigan coaches it's talent as well as Chris Peterson at Boise State we'll be in the NFL by 2014. Boise resident and Michigan alumni. Go Blue! Thu, Jan 12, 2012 : 5:28 a.m. I hope that these recruits are worthy of their rankings and catch on to college football quickly since Michigan opens the 2012 football season with a game against this year's national championship Alabama team. I am sure that some of the recruits will be called upon to start in that game. Thu, Jan 12, 2012 : 5:16 a.m. Pretty impressive that Hoke and Co. made such a big impact so quickly on the recruiting trail. If the recruiting keeps turning out similar classes UM will be at or near the top of the B1G every year. I wouldnt be surprised to see some of these freshman earn starting roles at some point next season. Thu, Jan 12, 2012 : 2 a.m.
Thu, Jan 12, 2012 : 8:19 p.m.
Yup that was the first thing I thought of too. Thu, Jan 12, 2012 : 12:07 a.m.
Epic Double-Point by Hoke!! WHOOOO!! !